If the F-15 driver had not been paying attention there would have been a coming together. This was not the only recent incident ; Russian Su-27 jet flies within 5 feet of U.S. Navy EP-3 plane over Black Sea: Pentagon. The U.S. Navy EP-3 Aries aircraft was intercepted by a Russian SU-27 jet, Pentagon spokeswoman Capt. Pamela Kunze said in a statement. The encounter lasted two hours and 40 minutes, Kunze said. The Russian jet came within 5 feet of the U.S. plane and crossed directly through its flight path, causing the EP-3 to fly through a trail of turbulence. Kunze said the Russian military is "within its right" to fly in international airspace, but they "must behave within international standards set to ensure safety and prevent incidents." That is typical behavior of intercepted Russian aircraft. A MiG-31 did the same thing to an F-16. sprstdlyscottsmn wrote: That is typical behavior of intercepted Russian aircraft. A MiG-31 did the same thing to an F-16. If a B-52 were intercepted by a Flanker, and an F-15 came on the scene, would it get between the Flanker and the B-52 and force it away as happened here? marsavian wrote: If the F-15 driver had not been paying attention there would have been a coming together. If you look carefully, there was a small initial feint by the Flanker towards the Eagle. When the Eagle reacted to it the Flanker then came over into the turn (because he knew the Eagle pilot was watching so he could safely do so). If the Eagle hadn't reacted to the initial feint the Flanker wouldn't have hit him. It likely would have repeated the feint. They're not stupid. 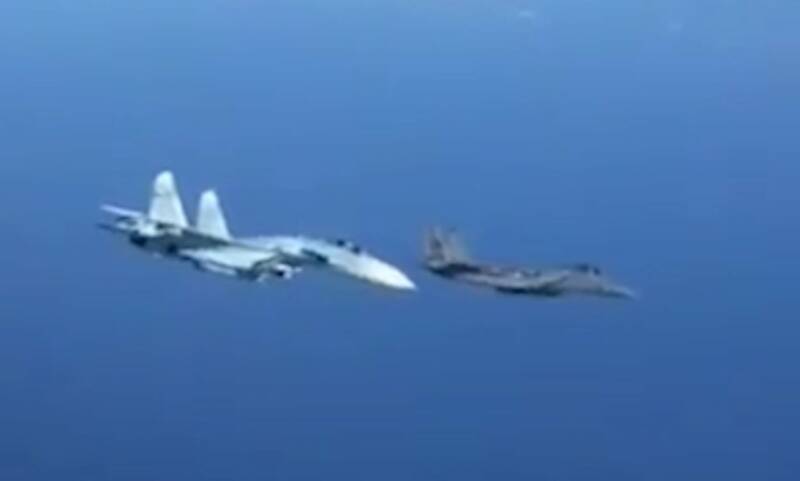 Flanker pilot was basically saying, "hey, let's move away". And the WSO took out a camera to take snaps. Reading the translation of the IG post you would think he just became an ACE ! Comical peurile stuff ! The real world (combat) evidence is clear: Russian fighters are routinely trounced by American made jets. Sure, you can argue they were downgraded export models flown by rookie hacks, but c'mon. At some point you need to admit defeat. Like when Mig-21's, 23's, 25's and 29's are regularly turned into spare parts, teeth and eyeballs in the skies over (Iraq, Serbia, the Middle East etc, take your pick). I suppose the Flanker is their last hope. Beautiful jet, but its days as numero uno were over even as it was initially fielded. F-22's and 35's will make short work of it, and I wouldn't be surprised if F-15 or 16's join that party as well. Mixelflick you surprise me, I thought you would have been all over super-maneuvrable Flankers showing F-18s the way home ! At least its not a YF-17 Cobra this time. 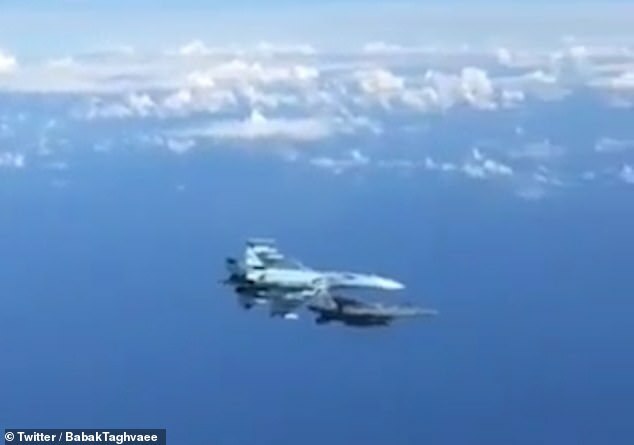 marsavian wrote: Mixelflick you surprise me, I thought you would have been all over super-maneuvrable Flankers showing F-18s the way home ! I still don't like the F-18. But they are infinitely more combat capable vs. their Russian counterparts. The big, rangy Flanker family can carry a good war load to great altitude and on kinematics alone is superior to some Western jets. At the very least, you have to admire the airframe. They've really taken the podded platypus concept originally seen in the F-14 and run with it. But they are let down in systems and in particular, weapons. The R-27 doesn't have a single BVR "hit" that I'm aware of in combat. All R-27 fired by Eritrean/Ethiopian Mig-29's and SU-27's missed. If the F-35's BVR model of stealth, SA etc. works as advertised, they're in for a long day in future conflicts. If I were them, I'd sell as many "invincible" SU-35's as fast as possible. Because as soon as the first one falls to an F-35's (or F-15's!) AMRAAM, sales are going to drop off. mixelflick wrote: If I were them, I'd sell as many "invincible" SU-35's as fast as possible. Because as soon as the first one falls to an F-35's (or F-15's!) AMRAAM, sales are going to drop off. So what exactly would Su-35 buyers get instead? Look up how many T-90s Russia sold since GW (a lot).